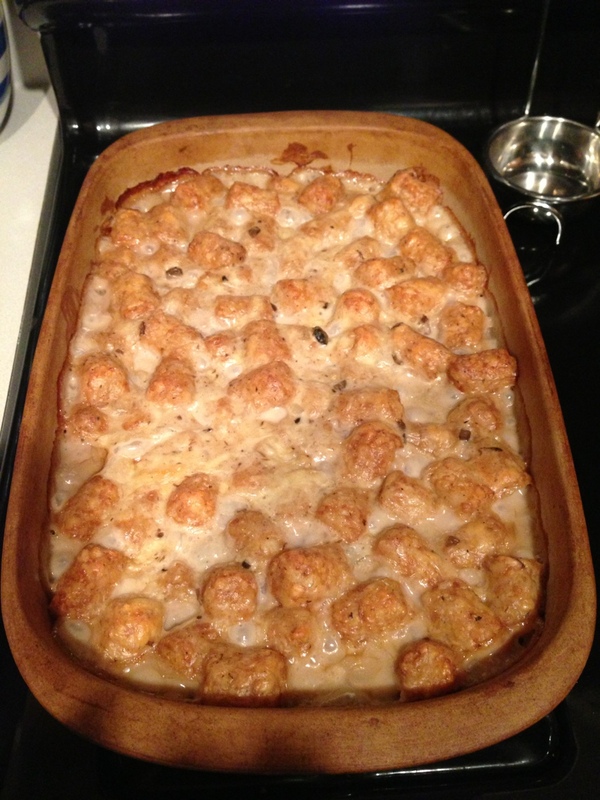 It seems like everywhere you look for recipes online, you will find one for a tater tot casserole. I always wanted to try making one. I’m not a huge fan of potatoes, but I like things like French fries, hash browns etc. When I went grocery shopping this weekend, I bought a bag of the tater tots to keep in the freezer for whenever inspiration struck. It struck yesterday. I was sitting at work, trying to figure out what the heck to cook for supper on a Monday night when I really didn’t feel like cooking. I remembered the tots in my freezer. So while I ate my lunch, I took to the internet to search for a recipe. I was kind of overwhelmed by the number of them, but I read enough of them to get the general idea, and take what I liked from each of them to make my own version. What I did is in the recipe that follows. cheese – a bunch, maybe 2 cups shredded. I used mozzarella because it was what I had on hand, but cheddar would be better. Start by browning the ground beef in a skillet. Dice and add the onion and garlic. Cook until meat is browned and veggies are tender. Drain if there is excess fat. In a large bowl, combine soups and cheese. Add tater tots and stir until they are all evenly coated. Spread ground beef in the bottom of a 9×13 casserole dish. Add tater tot mixture on top and spread to cover beef. Bake uncovered for at least an hour, until bubbly and hot and browned a bit on top. It was great with a bit of ketchup. All the measurements (as you can see) are approximate and can be adjusted to your taste, as I just kind of threw it together. A couple of weeks ago we celebrated the many milestones that occur this year in my husbands’ family. Several birthdays, my in-law’s 40th wedding anniversary, etc. There was quite a bit of food, and my sister-in-law Jennifer’s friend Sarah brought this delicious taco salad. I made sure to get the recipe from her so I could try it myself. I had never been much of a taco salad person. I think I ordered it once in a restaurant when I was younger. But this is a great recipe, though I imagine not much different than the other recipes floating around out there. I made it this weekend, and it was so good. If you’ve never tried it, you should definitely take a stab at it. I guarantee the bowl will be empty before you know it! Makes 1 very large bowl. In a skillet, brown ground beef, and add taco seasoning, according to package instructions. Set aside to cool, refrigerate until completely chilled. In a large bowl, combine lettuce, green pepper, green onions, tomatoes, cheese and hamburger. Crumble chips into large chunks, and add to salad. Add bottle of dressing, and combine completely. Store covered in fridge until ready to serve. This is great even the next day, you can throw some fresh chips in for crunch and a bit more dressing. I have a friend that uses Catalina dressing instead, that would be good too. If you wanted, you could fancy it up slightly by plating each serving separately, and line the outside of each serving with large restaurant style chips, garnishing with fresh tomato, green onions and cheese, making it a main course. This is great as a side, to take to a potluck or barbeque, or really, it can be a meal in itself. This is what I plan on having for supper tonight. You’ll notice the measurement for the curry is kind of screwy, mostly because this is just a thought up recipe and I just eyeball everything. 1 pkg. macaroni & cheese (Kraft Dinner for me!) – prepared as per package instructions. Brown ground beef in skillet. Add onions and mushrooms. Add curry (to be honest, I just keep shaking until it looks good to me – this should be done based on your taste in curry). Cook until onions and mushrooms are tender. Add prepared macaroni and cheese. Mix until well combined. That’s it – you’re done. It’s actually quite good – we put a dousing of ketchup on ours too. You could change this up in a hundred different ways, adding different vegetables, probably ground chicken would be good too. Instead of the curry, you could add taco seasoning and serve with tomatoes, green onions and sour cream. Hey! That sounds pretty good – might be an option for later in the week!